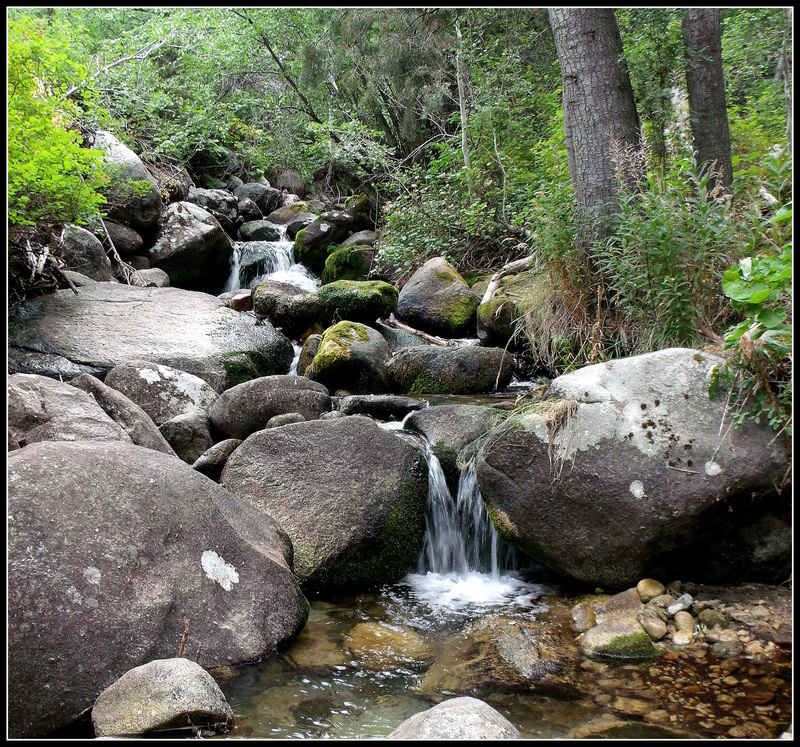 Three levels of falls down Bells Canyon Stream…along a favored trail that goes up, up, up into the mountains. The first photograph was taken in the middle of June, 2012…. And the second shot, with a slightly different perspective, is from near the end of August, 2012…about nine weeks later…. This entry was posted on August 26, 2012 by seekraz. 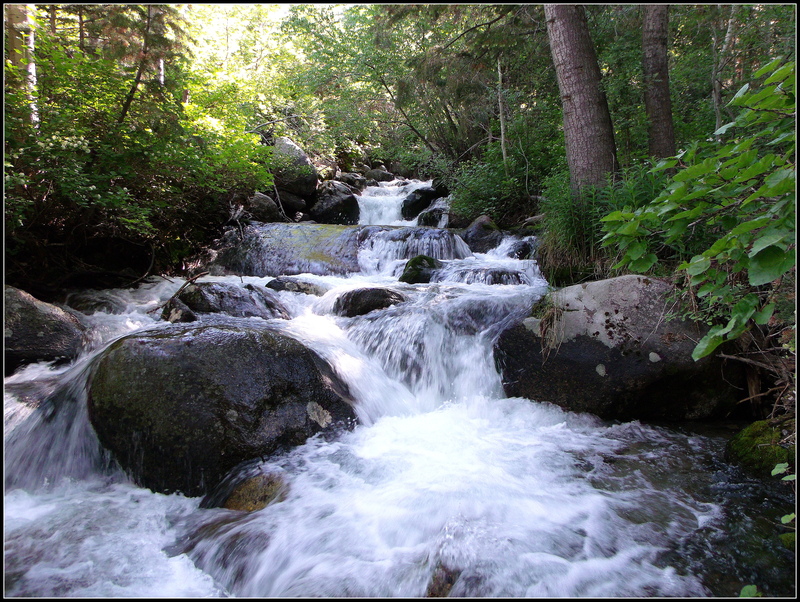 It was filed under Bells Canyon, Photos - Outdoors and was tagged with Bells Canyon Stream, hiking, natural beauty, nature, outdoors, peace, photography, Salt Lake City Utah, solitude, stream, Wasatch Mountains, Wasatch National Forest. Another beautiful location, Scott. Such clear water. Well worth the hike, for sure! Very nice comparison shot of the difference a little snow melt can make! It looks like you could use some rain too, although the first shot might have included a lot of snow melt. We could definitely use some rain, Allen…and yes, the stream was running so nicely in June because of the snow-melt. I must ask, did you climb up the rocks on your second outing? It would be too inviting for me not to! No, I didn’t stop to climb the rocks on that second trip, Bonnie…I passed this location very early in a much longer hike. I actually just took a couple of steps down from the trail, took two pictures of the stream, and then kept going on up the trail. Hi Scott. Quite a comparison. You sure do need some rain. I hope the reservoirs are coping. Hello, John – yes, there is a bit of difference between the two, primarily because of the snow-melt coming down the stream in the first one. And we could definitely use some rain…. That’s a beautiful little stream and a huge difference in water flow! I was just thinking of that when I saw a stream near here that is now down to a mere trickle too. I think the good news is that many of these mountain streams have places in their courses where they send a lot of water into the underground system. I know of several here that do that. It is a huge difference, Terry…I know that much of the flow is impacted by the snow-melt being gone at this time of year. I haven’t heard of any of our stream water going underground here…I suppose it’s quite possible, but with the diminished flow at all levels of the stream (top to bottom), I don’t know that that’s what is happening here. Thank you for offering that possibility…I’ll ask about it when I encounter some more experienced hikers/nature folks out here and see if I can find anything about it on-line. There is a creek close by here that is completely dry at the bottom end this time of year but has a very good flow about a mile up the canyon. It’s pretty cool how that happens…. Wonderful shots, and amazing to see the contrast! Nice pair of images. You’ve captured the rush of water really well in that first one. I love places like this, the sound of the water over the rocks, just beautiful and your photos show it off really well Scott. Thank you, Leanne…I appreciate your kind words. Ah, she waits for the snow-melt! I can feel it in the photographs. Wonderful comparison photos! You sure live in a beautiful place, anytime of year. I agree, Karen…it still blows me away how beautiful it is….